"Alle 10 Jährigen zu uns" which means "All 10 year olds (come) to us.". Washington, DC—I want to warn my visitors of the despicable and frightening way Socialist governments abuse children to enforce and establish absolute control over the population. The Socialist state indoctrinates children in vital youth programs. 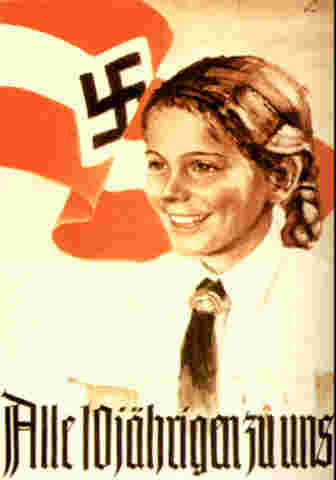 They all emulate the highly successful, Hitler Youth. The idea is to create a sense of cult-style loyalty to the government or political leaders above and beyond that of the child’s parents. The properly indoctrinated child will be rewarded for “helping” their parents by informing on them. The children are programmed to spy on their parents and their parent’s friends. The children are encouraged to inform on the reading material or broadcast viewing habits of their parents along with things like weapons ownership or plans to escape from or otherwise defeat Socialism. Parents that cause discomfort to politicians and bureaucrats by political activity or an expressed desire to flee from the Socialist state get a visit from the local social service agency and police. The parents are deemed unfit to raise children and they never see them again. The kids are sent for adoption or orphanages that groom them for government or military service. Innocent children have been duped into sending their parents to firing squads, gulags, concentration camps and torture chambers in every Socialist nation. Yes, it can happen here too. This form of punishment was a common practice by the East German Communists during the Cold War against people believed trying to escape to the West. It was also used by the National Socialists against all parents in the countries they occupied during World War Two. School teachers are rewarded for their ability to get children to tattle on their parents under Socialist regimes. Socialists hate the concept of private schools and any form of home schooling because it removes children from Socialist indoctrination that’s absolutely necessary to keep power. The Socialist’s abuse of children is popular because it works so well. if we start with the presumption that the financing of education is a valid and beneficial function of government, via taxation on a state's populace, valid as a means to ensure that all school aged children residing in said state have the opportunity to acquire knowledge and develop skills which are both necessary and beneficial to the society in which they live, then the first question to be addressed is by what means can this be accomplished most efficiently, economically, reliably and with the highest quality as humanly possible? our present system of publicly owned, tax financed and government operated school systems has a few inherent positives and many unnecessary negatives. this article defines one major, huge negative. a short list of the many other negatives would be quite long, far too long for blogger to accept. suffice to say, many of these negatives would be rendered null and void were a total voucher based, state level financed, system of providing tax based vouchers to accomplish the valid purpose outlined above. all other negatives would be substantially mitigated via rational compromises, said compromises being based on the greater public good being the deciding factor. voucher amounts would be the economic base ingredient, with each, individual deciding whether or not a given, preferred school's higher than the voucher amount tuition warranted an out of their own pocket investment in their child's education. yes, this means all schools become de facto private enterprises. yes, this means the dissolution of publicly owned and operated schools and school systems. and no, this doesn't mean the total elimination of public oversight of education, just the substantial elimination of the politics negatively affecting the nature and substance of our current educational institutions. the concept of theoretically free economic markets producing the best outcomes, via a consumer driven balance between quality and cost, is what once made our country the envy of all other social/economic systems. Tyranny can only exist if it has thugs to execute its agenda.